Want to be a member of our teaching team? Thank you for your interest in teaching positions with our growing school. This page will give you an idea of our philosophy of teaching and our ideas on how our school can best meet the needs of our students and teachers. No Phone Calls please. Only suitable applicants will be contacted for an interview. Reference- and Background Checks will be performed before actual hire. 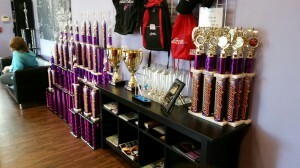 We are Charlotte Area’s Premier Dance Academy with approximately 400+ students attending weekly classes . We cater mainly to children. About 90% of our students are between 3 and 16 years old. We welcome adult students but our suburban market area has resulted in a student base of mainly children. We realize that most of our students will not become professional dancers. We strive to provide a fun but educational environment with well organized administration and first rate equipment and facilities. There are several places you can teach dance around the Charlotte area. Why should you consider teaching with us? We limit class sizes to make classes easier to control and monitor for teachers and to give more personalized attention to students. Our classes for ages 2-5 are limited to a maximum of 10 students per class. Our classes for ages 6 and up are limited to a maximum of 12 students per class. In many studios there is no receptionist on duty. This means that the teachers are faced with administration details when they should be concentrating on teaching. In most cases, we have front desk administrative staff during class times to handle routine questions and details that arise..E-mail support is available 7 days a week as well , and e-mails will usually be responded to within 24 hours…. This dance floor helps prevent injuries and fatigue. A good quality floor is a consideration if you are going to be teaching for a few hours each day. A supportive quality floor allows you to protect your most important assets – your body and your ability to teach. We try to take care of all of the extra details throughout the year. Teachers are not required to collect any fees . We try to have everything well organized so the teachers are free to concentrate on teaching and nothing else.